Spencerville senior Rebecca Stetler plays the trumpet surrounded by flags during last year’s fair. • The Kewpee Showcase of Bands begins at 7 p.m. Friday, Aug. 17. The OSU Alumni Marching Band will perform at 6:30 p.m. Admission is $5 for ages 7 and older, with younger children free. • The Cheerleading Competition begins at 7 p.m. Wednesday, Aug. 22. Admission is $5 for ages 7 and older, with younger children free. • The Baton and Flag Corps Competition begins at 9 a.m. Saturday, Aug. 25. Admission is free. All shows are held at the grandstand. 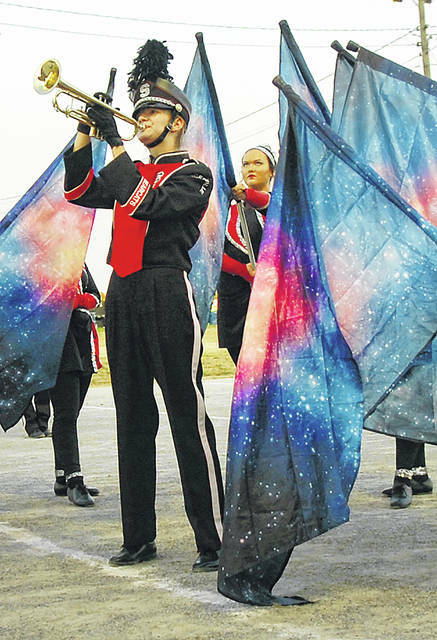 LIMA — The band show, cheer show, and baton and flag show will be at the grandstand again this year, bringing all-new entertainment. The marching band show will open the fair this year. The band show is sponsored by Kewpee Hamburgers. The cheerleading competition is Aug. 22. The competition is sponsored by Reineke Family Dealership and 92.1 The Frog. Finally, the baton and flag corps competition will be Aug. 25. The event is sponsored by Max’s Trader Days and Water Dog Races. The competitions and events have showcased area students’ talent for a long time.